Ahhh snow.... and cold... and colds... how did we get here again? Now that the chillier days of the year have arrived, it’s time to be extra vigilant in the fight against those pesky viruses ready to wreak havoc on your health. But if you find yourself in a losing battle against sickness, make sure you’re armed and ready to face it head on. 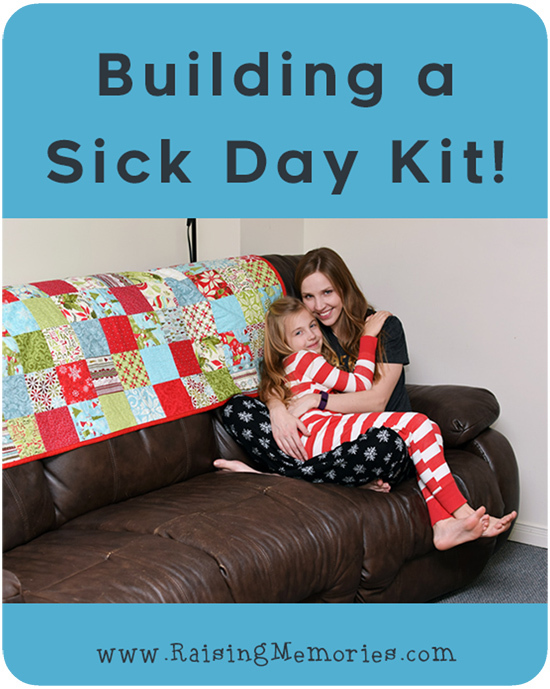 Here are some ideas for building your own sick day kit, so you can be ready for lots of different types of sick days! - Chamomile tea: Chamomile tea can help ease the pain of an upset stomach. Keep a couple of packets in your kit to help reduce unpleasant cramping . - Heating pad: We recently realized that we had lost our heating pad in the smoke. The plan is to get a new one before someone has a sore tummy again, so we'll be ready for it next time! They are an inexpensive and cheerful way to sooth and calm your stomach . They also give you that warm comfy feeling that will make curling up on the couch much more pleasant. - Tissues: There’s nothing worse than running out of tissues when your nose is leaking like a faucet. Our family always has tissues on hand- in every bathroom, in bedrooms... we're big fans! I like to keep the kind with lotion infused into them ready to pull out when someone is sick. Keep your nose happy with your favourite soft tissues and keep your family happy by leaving the toilet rolls where they belong - in the bathroom. - Soup packets: No one wants to cook when they're sick (let alone on regular days- ha!) and drinking soup is a great way to make sure you’re getting the liquids you need to stay hydrated. - Redoxon: Redoxon is a great way to get your vitamin C dose year-round whether you're sick or not, but it's especially helpful when a cold throws off your usual diet. Just one tablet gives you 10 oranges worth of vitamin C*! Redoxon also gives your water a fun fizz and flavour in case you’re getting tired of gulping down plain water all day. 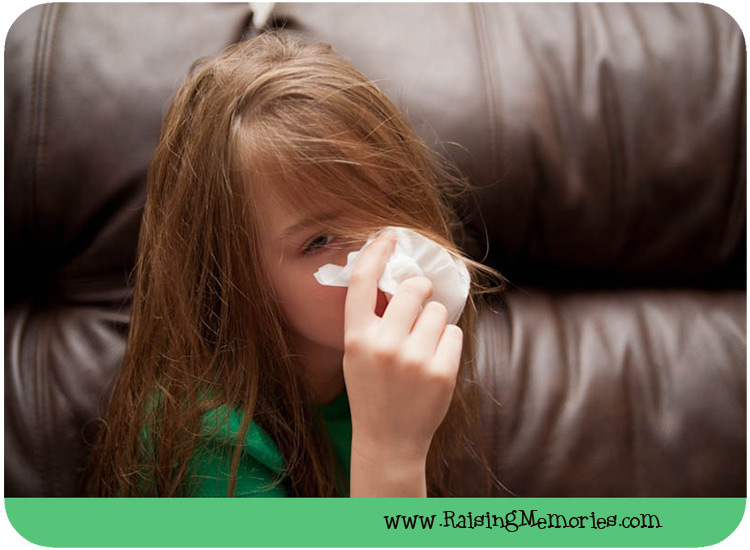 - hydraSense: Clear your nose fast with a hydraSense saline nasal spray for your nasal cold symptoms. Just spray, blow and you’re clear. 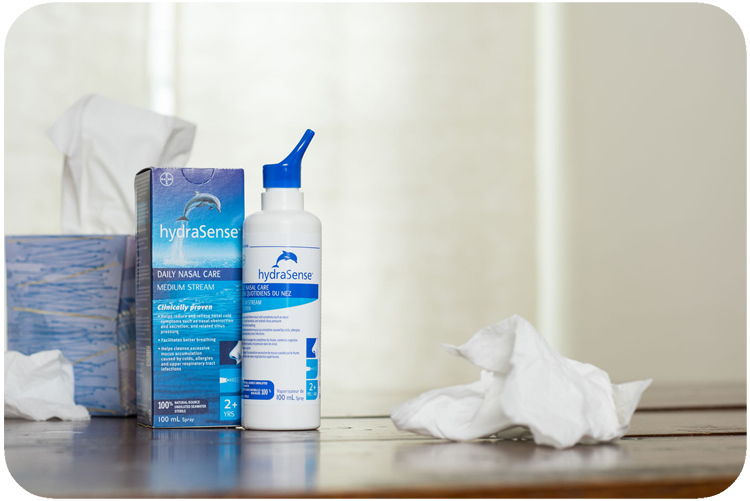 hydraSense is medicine-free, so you can use alongside your other cough and cold medication. After I discovered nasal rinses, I wondered how I ever got by without them! - Keep an over-the-counter pain reliever to help take the sting off your headache. - Essential oils: While essential oils may not have any scientific claim to healing, a nice peppermint, lavender or rosemary oil can help you. - Ice pack: An ice pack can help temporarily take the sting off a headache. Wrap the ice pack in a towel or cloth before applying for more comfort. For any type of sickness, don't underestimate the things you can do just to comfort someone else in your home! - Snuggles and Cuddles can go a long way! - One A Day multivitamins: When you're sick you may feel like you’ve been unable to eat much of anything, which means you may not be getting the important nutrients your body needs. 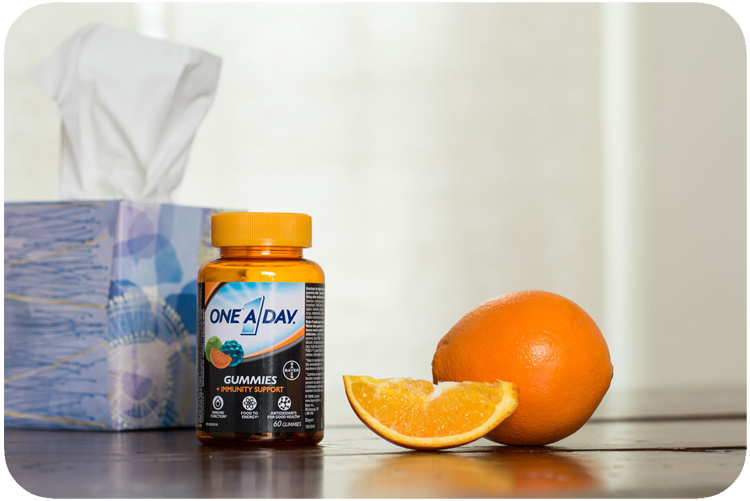 One A Day Gummies Plus Immunity Support contain zinc and vitamin C to help maintain immune health in a great-tasting gummy. - Motivational playlist: A great playlist will lift your spirits and get you motivated to start moving again. Try popping your headphones in and boost your energy levels with a solid workout. Whether it be yoga, hitting the gym or going for a jog, a good tune will put you in the proper mindset for a great sweat, so you feel as good as new! *Redoxon® is not meant to replace food. It's no fun when the germs start coming home from school! This is a great idea. Cold and flu season is here and it is good to be prepared! Thank you, and absolutely. If only we could truly keep it away! We just over round1! must replenish our supplies! Oh man- glad you're through it! I hope it's a good while before it hits again! Chamomile tea would be very helpful, I need to get some for this season! We make really weak peppermint tea as well - with honey of course! Such a good idea! 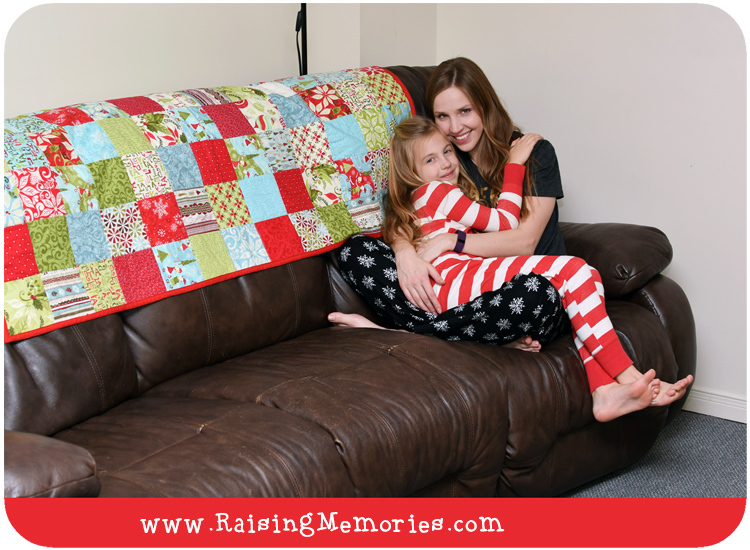 When I was growing up in a military family, if you stayed home sick you had to do chores! haha I guess they made sure you were REALLY sick that way! Thank you Lynda! That's a good idea to keep it organized like that! Thank you for sharing these tips. I’ll have to go pick up some redoxon just in case I need it. Thank you! Winter set in here early Fall and it's been one storm after another and everyone has a cold ! This is a awesome idea for a kit to have handy. We all eventually do get sick.